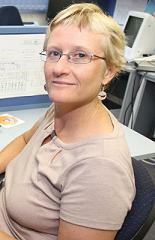 Dr Alison Reid is a senior research fellow at the Western Australian Institute for Medical Research. She was brought up in Perth and has a BSc (Anthropology) from University College, London and an MSc (Medical Demography) from the London School of Hygiene and Tropical Medicine. Dr Reid began her research career at the Office for National Statistics in London and returned to WA in 2000 where she joined the Wittenoom Cohort Studies, completing her PhD in 2008, examining the health outcomes of women exposed to blue asbestos. Dr Reid now leads a research project investigating the health of migrant workers and the safety of their workplaces.